Happy 2017! In this shiny New Year, you may have goals in mind for the months ahead. 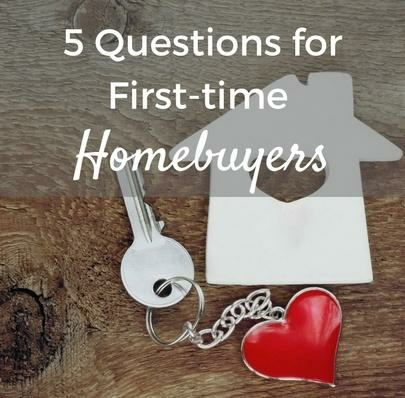 If those aspirations include buying a home, the MilitaryByOwner website is a great place to start. 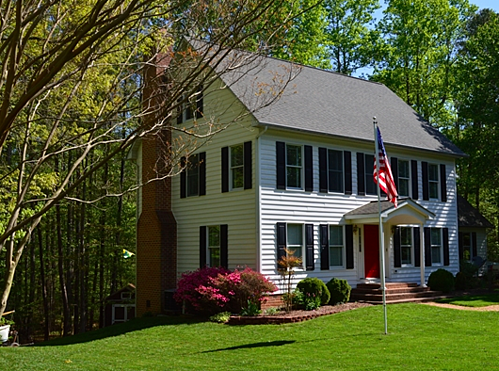 If your military family is anticipating an assignment to Naval Air Station Patuxent River, we’ve selected a few must-see homes in the Maryland area. Around 70 miles South of Washington D.C., the waters of the Chesapeake Bay meet the mouth of the Patuxent River at NAS Patuxent River. The dense woods and extensive trails of the nearby Patuxent River Natural Resource Management Area offer hiking options for an active family. After a full day of exploring, wander your way back to this grand oasis of a home. *Note: these homes are no longer listed. Please see currently available homes in Coastal Maryland. This Maryland manor is all about the view. 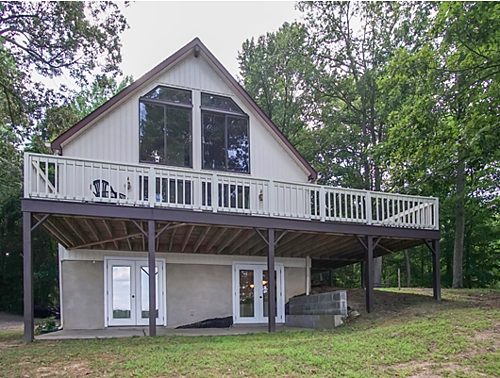 Boundless windows in this 5-bedroom, 3-bathroom home give a panoramic perspective of the nearby water and woods. Boasting nearly 2,900 square feet indoors, the well-kept decks offer additional outdoor living and entertaining space. Speaking of ample elbow room, a mother-in-law suite with full kitchen and private entry may be ideal accommodations for family or friends on an extended visit. Or, this lower level living space may serve as an optimum rental opportunity. Perhaps this waterfront retreat may fit a military member looking to be a “geo bachelor”(live solo at this military assignment). After a brief commute from NAS Pax River, you'll feel as if you are returning home from work to a vacation property. 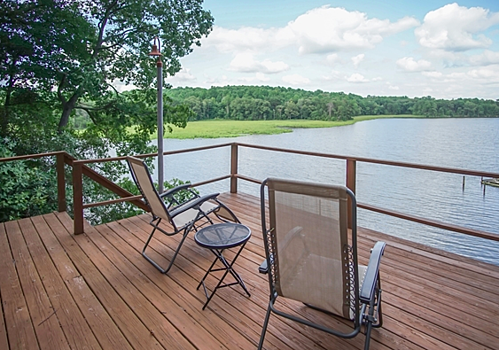 The allure of this 2.65 acre resort style abode includes 2 boatlifts off the private pier. 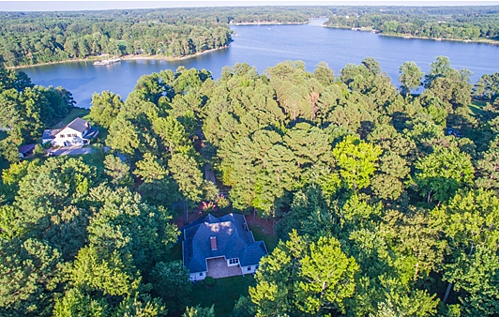 With the beauty of nature all around, set sail with this convenient water access or simply enjoy the pleasures of the palatial porches of this Pax River property. If Hollywood, California is where actors chase their dreams, then Hollywood, Maryland is where dreams come true! 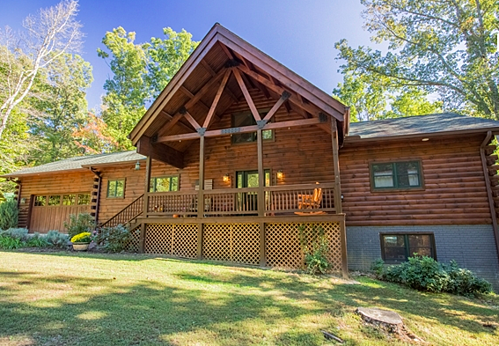 If you’ve had visions of living in a log cabin, this 3,500 square-foot luxury lodge may be just what you’ve wished for. 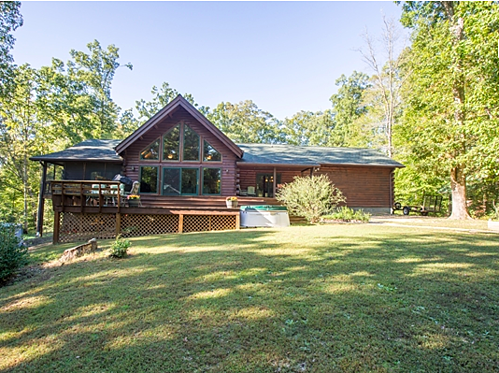 Near the St. Thomas Creek inlet of the Patuxent River, around 13 miles from NAS Pax River, you’ll find this 4-bedroom, 2½-bathroom home on a sprawling 20 acre estate. 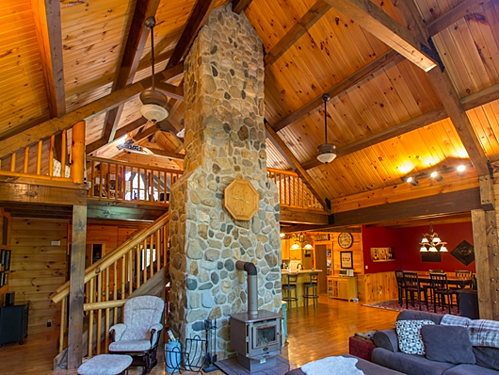 The aesthetic appeal of the surrounding woods is mirrored throughout this log cabin style home. 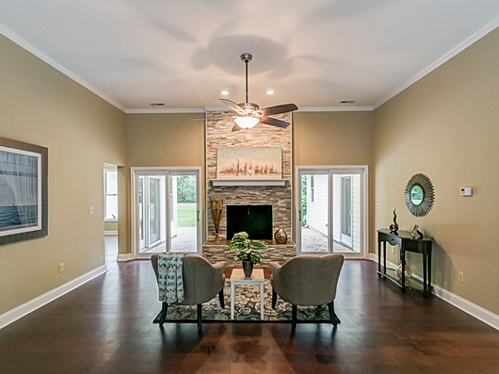 Sky-high windows and vaulted ceilings accent the vast layout of the open concept floor plan. Exposed beams. Log railings. Wood paneling. River stone chimney. 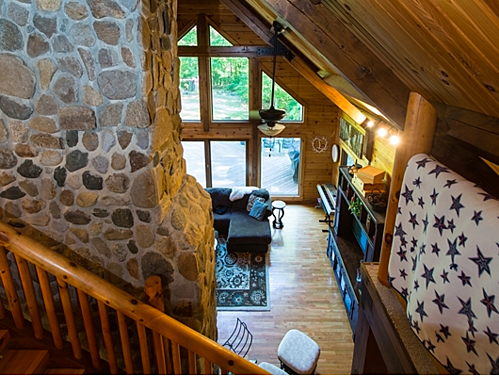 These rustic lodge details seem to fill each nook and cranny of this premium property. 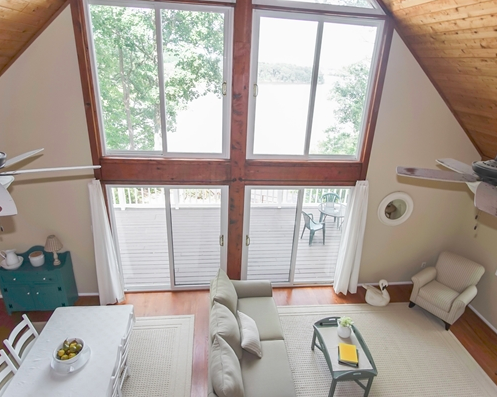 An upper deck loft space and lower level multipurpose room may serve as added guest quarters when the entire family rallies at this Maryland retreat. Linger in the main floor master bedroom suite with its tranquil screened-in porch. Or, float all of your cares away in the private hot tub on the back deck. Out here in these quiet woods it’s just you and whatever wildlife may wander by. If log cabin living fits your needs at this assignment, this stunning manor may be a woodsy dream come true. Established in 1660, Leonardtown, Maryland is brimming with colonial history. With storied times in mind, this colonial style home on 2.4 acres combines old world charm with modern conveniences and upgrades. Do you enjoy exploring both the water and the woods? This Chestnut Ridge manor is tucked between the Potomac River White Point Beach and the trails of St. Mary’s River State Park, around 9 miles from NAS Pax River. With three stories and classic colonial style, this 5-bedroom 4½-bathroom home has plenty of room for an active, outdoorsy military family. 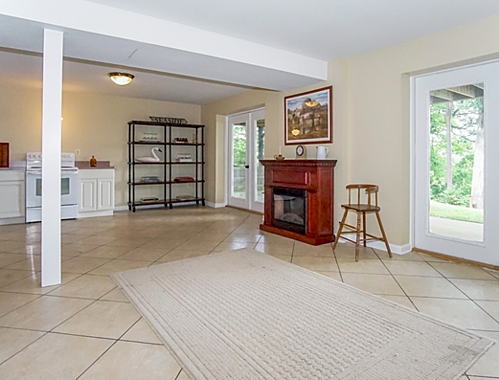 Elegant 15-pane doors lead from one room to another with original oak hardwood floors throughout. 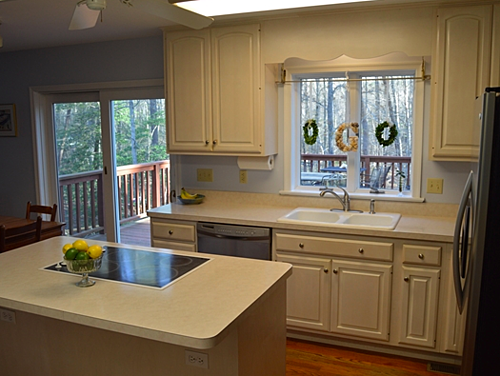 The all white kitchen includes shimmering stainless appliances and an island cooktop. Eat in or dine al fresco on the adjoining multi-tiered deck. 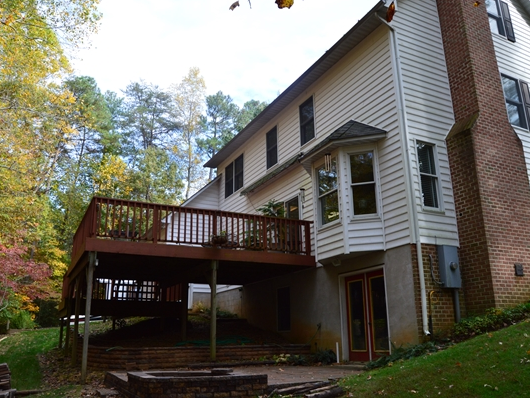 Grand homes around Maryland seem to offer plenty of potential with living space on the lower level. This pleasing 3,200 square foot property also combines a craft room, full bath, wet bar, and a man cave within the spacious walkout basement. With plenty of room at this address, gather with co-workers and neighbors in this friendly historic community. One definition of the word “nestled” is “to be naturally or pleasantly situated.” Perhaps the dictionary was thinking of this Maryland estate when writing up that meaning? Like a bird in a luxurious nest, we find this 2,700 square foot manor in Dutchman’s Cove of the St Mary’s River. Nestled in scenic woods near calm waters, this exquisite 4-bedroom, 3-bathroom home gives a sleek, modern take on single story living. 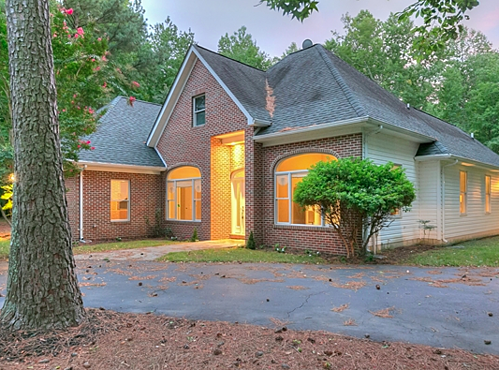 Rich hardwood floors, Italianesque tile, and plush carpet are noted from room to room. Pleasing palettes color the walls while bisque baseboards define the edges. 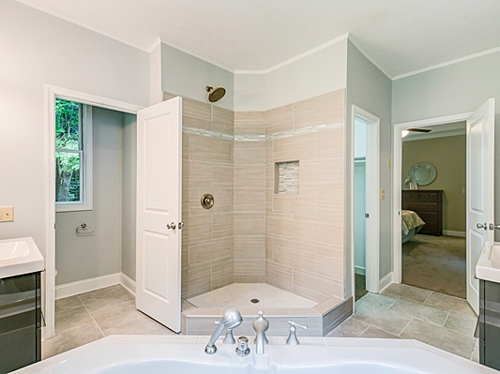 You’ll feel like royalty with the decadent en suite master bath. From the sensational shower to the bubbling bath, every inch of the loo is meant for premium spa pampering. Separate vanities, private commode, walk-in closet: it’s all within reach of your bedroom retreat. Warm natural light filters amidst the surrounding trees of this 1.5 acre property through the abundant designer windows. At the focal point of the family room, double doors flank a striking stacked stone-effect fireplace. This extends the living space outward onto an expansive patio. This treasure can be discovered when venturing 11 miles or so from NAS Pax River. As 2017 begins, these are just a glimpse of available homes in Coastal Maryland. No matter what size or style of home you prefer, may the homes you consider stir a sense of maritime charm with this waterfront assignment!